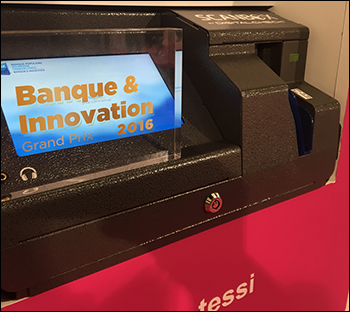 NORTHBROOK, IL, October 5, 2016 – Digital Check and Tessi introduced the new ScanBox by Digital Check self-service platform at last week’s Paris Banque & Innovation Show – at which it was named the winner of the Grand Prix Banque & Innovation Award. The new product, which was making its debut in the French market, incorporates Digital Check scanning and network technology into a compact check deposit kiosk for bank branches, retail and corporate environments. It was introduced at the event in collaboration with Tessi – a leading provider of banking systems and services throughout Europe, and Digital Check’s document automation partner for France. The self-contained ScanBox device operates independently of any tethered PC, accepting commands from a built-in touchscreen and communicating with other banking systems over a wired, wireless, or even a 3G/4G mobile network. It also pairs with Tessi SCANTOPAY mobile remote deposit capture application to allow smartphone- or tablet-initiated deposits and real-time tracking on mobile devices. Eric Jamet, Marketing Director for Tessi documents services, believes the ScanBox will play an integral part in branch modernization efforts in France and throughout Europe. In addition to the banking market, ScanBox also targets a broad range of applications such as walk-up billpay in utility and government sectors. It is currently in limited release in France and Western Europe, with North American and global introductions to follow at a later date. Digital Check provides superior check scanners and document capture products for teller capture, branch automation, remote deposit capture, and remote lockbox applications. Digital Check’s award-winning CheXpress®, TellerScan®, BranchXpress®, SmartSource® and SB™ Series check and document scanners are among the most cost-effective and reliable in the industry, and provide high-quality images with precise MICR accuracy. The company’s scanners are available in over 100 countries worldwide through a network of more than 200 Authorized Solutions Providers and are supported by Digital Check’s comprehensive training, support, warranty and repair services. For more information call 847-446-2285 or visit www.digitalcheck.com. Tessi documents services is the business segment of Tessi specializing in multichannel management of document flows, means of payment, customer relationship processes and back office business. Its outsourced services and technology solutions are deployed to more than 1500 banks, businesses and governments in their optimization projects and digital transformation processes. For more information, visit www.tessidocumentsservices.fr or www.tessi.fr.